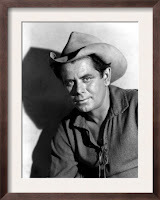 THE MAN FROM THE ALAMO is a crisply paced Western directed by the great Budd Boetticher, with Glenn Ford in the title role. 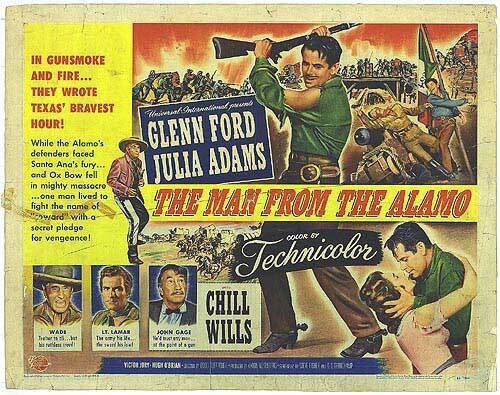 Things look bleak at the Alamo when John Stroud (Ford) leaves in order to try to protect his family and the families of his friends. He arrives home to discover his wife and son were murdered by American renegades. Stroud plans to return to the Alamo, but word comes that it has fallen to Santa Anna. Local townspeople, led by John Gage (Chill Wills) and Lt. Lamar (Hugh O'Brian), look down on Stroud as dishonorable, but pretty Beth Anders (Julia Adams) is intrigued by him. Stroud proves his worth protecting a wagon train of women and children from the same gang that killed his family, then rides off to fight once more for Texas. That's pretty much all there is to this compact 79-minute story. Ford, as he so often did, plays a fairly morose character, but he's quite effective, especially in those moments when he suddenly explodes in violence. He's got a couple of well-staged fight scenes. Stroud's interplay with Lt. Lamar is interesting, especially when Stroud refuses to defend himself against Lamar's needling. Lamar later is confronted himself with the choice of duty and protecting his family, and he and Stroud reach a new understanding. The film has a fairly typical Universal cast of the era, including lovely Julie Adams as the leading lady. (I've shared in the past that as a teenager I was fortunate enough to have a small role in a play with Miss Adams, a wonderful lady.) Neville Brand, Jeanne Cooper, Dennis Weaver, Victor Jory, Guy Williams, and Arthur Space all appear in the film. The film's main drawbacks are a downbeat storyline -- the fast pace helps compensate for that -- and fairly low-grade production values. One never forgets for a moment that the Alamo is a movie set. The rest of the movie was filmed largely outdoors, but I felt the plains of Texas were just a little too obviously Southern California; I kept expecting to see the Ingalls family from the later TV series LITTLE HOUSE ON THE PRAIRIE when the wagon train went around the bend. The town setting is the Mexican street on the Universal backlot, which is still in use decades later. The film has an effective score by Frank Skinner. The Technicolor cinematography was by Russell Metty. 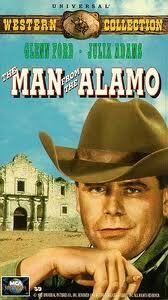 THE MAN FROM THE ALAMO was released on VHS. It's also on DVD, in a nice print, as part of the Classic Western Roundup, Volume 2. 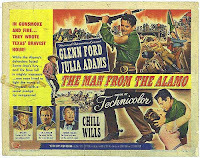 The other three titles in the set are THE TEXANS (1938) with Randolph Scott and Joan Bennett, CALIFORNIA (1946) with Ray Milland and Barbara Stanwyck, and THE CIMARRON KID (1952), another Boetticher film, which starred Audie Murphy and Beverly Tyler. The DVD can be rented from Netflix.